The Rhino Bilt Deluxe Boot scraper is perfect for outdoor and indoor use! The durable mounting options provided give you unlimited mounting locations! Mount it at your home, ranch, farm, workshop, job site, garage, patio, beach home, or a hunting camp! Keep that nasty crud out of your home! The extensive five-brush system removes mud, snow, dirt, red dirt, sand, leaves, and debris. With an extra wide 4-½'' access it allows for any shoe sizes! The entire scrubber is made with a one-piece heavy thick-gauge steel base that gives everything a study feel. 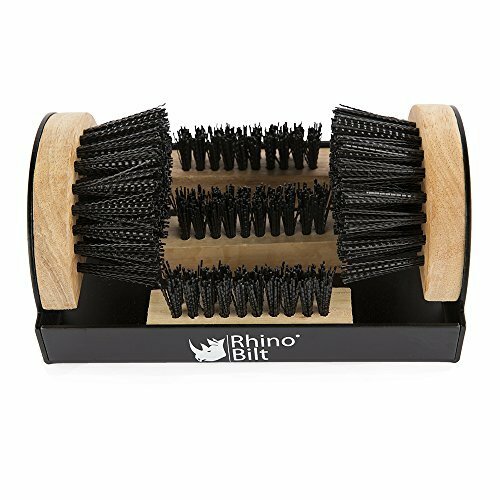 Weatherproof treated hardwood and durable polymer bristles allow for a weather resistant, long lasting life. Mounting is recommended to achieve best results, all mounting hardware is included. Both spikes and anchors along with a drill bit to drill the anchors in! Both temporary and permanent installations are provided. Spikes give you a temporary mount for campsites, beaches etc. and the anchors provide a permanent solution perfect for your home, garage, barn, and other locations you wouldn't want it to move from. Never track dirt into your home again! The Rhino Bilt Lifetime Warranty is included free of charge on all Rhino Bilt products. This includes, but is not limited to, the Rhino Bilt Jumper Cables, Original Boot Scraper, Folding Side Boot Scraper, and the Deluxe Boot Scraper. If you encounter a defect in materials or workmanship, we will gladly provide a replacement product or part(s) for free. Shipping charges may apply in some cases. MOUNTING REQUIRED HARDWARE INCLUDED anchors and spikes allow for multiple mounting options. Spikes give you more of a temporary location while anchors give you a permanent solution! VERSATILE The Deluxe Boot Scraper is perfect for any location! Homes, ranches, farms, workshops, job sites, garages, patios, beach homes, hunting camps, even golf courses! EXTRA WIDE 4-1/2" opening allows for any shoe size to be quickly cleaned, including big massive work boots! MOUNT ANYWHERE durable weatherproof hardwood with one-piece thick gauge steel exterior, and powder coated to prevent rusting in muddy, wet, snowy weather to last for years to come. ALL-IN-ONE scrubber, scraper, and cleaner, the strong five polymer brush bristles remove mud, snow, dirt, rock, gravel, red dirt, sand, leaves, and debris from tacking into your home or work. The triple brush base provides faster and efficient removal of debris and far surpasses the capabilities of other shoe scrapers. View More In Boot Scrapers. If you have any questions about this product by Rhino Bilt, contact us by completing and submitting the form below. If you are looking for a specif part number, please include it with your message.